12 Want to use data science to work on a priority area? We want to help. 12.1 Think you should do something else? If you have a PhD in a quantitative subject (or if you’re the type of person who would enjoy a quantitative PhD), but are not sure you want to go into academia, consider data science. It can provide the intellectual satisfaction of research, but with more immediate, tangible results, and more team work. And you’ll get a great skill-set that’s increasingly in-demand in a wide variety of important areas. • Gain the ability to generate actionable insights from the increasing amount of data collected by humanity, opening the opportunity to contribute a wide range of causes. • Develop undersupplied skills in programming, machine learning and statistics, for which demand is forecast to grow rapidly, opening many options. • Cultures of learning and mentorship, often reasonable hours and flexible hours. • High starting salaries; graduates of data science bootcamp Zipfian Academy earn $115K on average. • A large portion of time is spent on cleaning data, which most find unexciting. • Pressure to find and deliver immediately actionable insights; less scope for longer term exploratory research. Strong quantitative skills (e.g. would consider doing a science PhD); strong interest in applied research; able to communicate technical ideas clearly to non-technical audiences. You can easily test your fit for this career by taking an Intro to Data Science course. You can enter either by self-learning, building a portfolio of projects on a blog and GitHub, and applying to companies directly, or you can take a data science bootcamp. In the US, the two best known bootcamps for PhD holders are Insight Data Science and The Data Incubator, and for those without a PhD Galvanize. Signal Data Science is a bootcamp run by supporters of 80,000 Hours. In the UK there is ASI Fellowship (also run by supporters of 80,000 Hours) and Science to Data Science, both of which only accept PhD holders. For this profile, we interviewed a senior data scientist in industry, a junior data scientist in government and read the following sources. See all our research in our wiki. Due to recent advances in technology, humanity is collecting vast amounts of data at an unprecedented rate. Data scientists use techniques drawn from computer science and statistics to generate actionable insights from this data. They work in industries as varied as medicine, online-education, finance and government, and have done everything from predicting the results of national elections to preventing house fires. In this profile we focus on the pros and cons of spending 2-5 years working as a data scientist. Data science jobs involve obtaining data, cleaning it, analysing it and communicating actionable insights to decision makers in organisations. The title ‘Data scientist’ is used for a wide range of jobs, which range from entry-level positions only requiring basic knowledge of databases and Excel, all the way to high-level roles which involve inventing new algorithms, working with very large data sets and undirected research into open-ended questions. Entry level roles sometimes go by the name of ‘data analyst’ or ‘junior data scientist’. Read more on the different types of data science jobs here. Data scientists are commonly employed by large tech companies, like Google and Facebook, tech startups, governments and non-profit research institutions (where they’re often just called analysts or researchers), e-commerce companies like Amazon and entertainment companies like Netflix. Day to day, data scientists spend a lot of their time (often up to 80%) finding data sources and using computer programs to clean data to prepare it for analysis, running analyses and communicating their results by writing reports or doing presentations. They also spend time on generating project ideas and planning them out. For many entry-level roles, an undergraduate degree is sufficient. More advanced roles often require an advanced degree in a quantitative subject like computer science, physics, statistics or applied maths. To get an entry-level job you usually need basic familiarity with a statistical programming language like R or Python, statistics, basic machine learning algorithms, database systems and data communication and visualisation. For more, see this skills checklist. You can gain these skills either by self-learning and building a portfolio or by entering a data science bootcamp. Entry to Data Science bootcamps is highly competitive and placement rates vary. Our impression is that if you are smart in a quantitative and analytical way, dedicated and put a lot of effort into pre-study, you have a good chance of getting a bootcamp place. As a data scientist your impact mainly comes from furthering the goals of the organisation you work for, meaning that your impact largely depends on where you work. Many organisations that employ data scientists contribute to innovation and are socially impactful, including the Center for Disease Control, Google, Khan Academy, Bayes Impact and DataKind. But even working for organisations whose goals aren’t directly linked with increasing social value may still be substantially valuable due to the “flow-through effects” of increasing general human empowerment. However your impact will be lower in industries with elements of zero-sum competition to gain market share such as marketing. According to O’Reilly, the major industries with the highest median salaries for data scientists are finance ($117k) and software ($116k). By country, the US has the highest median salaries ($117k), followed by Canada ($95k), Australia/New Zealand ($90k), and UK and Ireland ($82k). 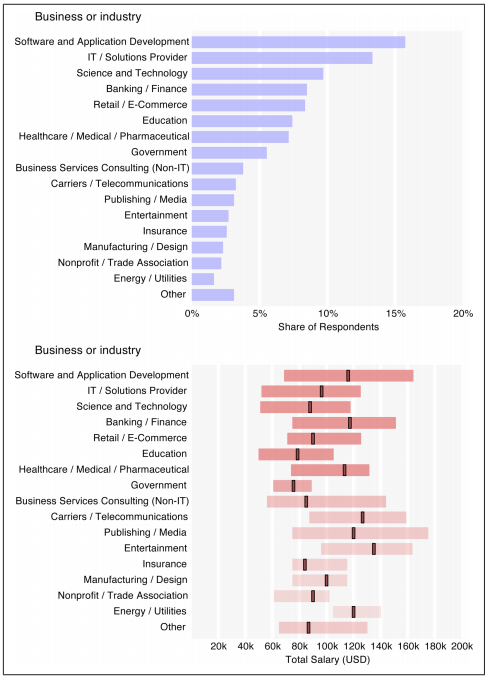 Data science salaries by business and industry. Source O’Reilly. Graduates of Zipfian Academy make an average $115K as a base salary following the program. Data Incubator reports that its graduates can get starting salaries of $100K to $200K. You can predict your own expected salary by plugging variables into this regression model created by O’Reilly. Data scientists are employed in a wide range of industries including technology, medicine and government, which gives you the opportunity to advise decision makers in the industry that you get a job in. As a data scientist you develop skills in programming, machine learning, maths and statistics, as well as detailed working knowledge of the industry you work in. These skills are likely to become increasingly valuable in the future across a wide range of industries (hiring is projected to increase by 18.7%), which gives you great option value and strong bargaining power to negotiate salary and working conditions. The technical skills you develop also open the possibility to transition into different roles including software engineering, founding or joining early-stage startups, academia,2 and quant finance. You can gain detailed working knowledge of the industry and organisation you work in, but otherwise data science isn’t especially good for exploration value. Our impression from talking to data scientists is that the work is highly intellectually satisfying and the results of your work are highly tangible. Working conditions for data scientists are typically better than many corporate jobs, with 40-50 hour weeks (though this varies a lot on industry and team), and cultures of learning and mentorship are common. The biggest and most commonly cited downside of the job is cleaning data, which you spend a significant portion of your doing (but this varies by company and role), and is the least interesting part of the job. Want to use data science to work on a priority area? We want to help.